WEST LAFAYETTE, Ind. — Purdue University will offer two separate workshops this summer for those interested in making their own electric guitars. The High School Guitar Workshop will be held June 23-26 and is open to any student entering 10th, 11th or 12th grades. Students will be introduced to various advanced manufacturing technologies used in the guitar-making process and taught in the College of Technology. No previous experience with woodworking or manufacturing tools is necessary. Students will stay in residence halls and eat in campus dining halls during the week. They also will have the opportunity to explore the campus during the evenings to get a taste of college life at Purdue, said workshop director Mark French, an assistant professor of mechanical engineering technology. The Society of Manufacturing Engineers Education Foundation and the D’Addario Music Foundation are sponsoring the workshop. 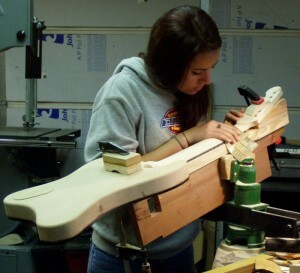 The second workshop is the Purdue Guitar Workshop from July 6-10. It will feature industry professionals who will teach participants how to craft, engineer and customize their own solid-body electric guitar. Experts from Purdue, Taylor Guitars and Fender Guitars will be in attendance. The class will meet daily from 8 a.m. to 5 p.m. in the Knoy Hall of Technology, Room 106, and Michael Golden Labs, rooms 1208 and B217. Workshop participants will learn the practical and technical aspects of making guitars. The class is not for credit, and no previous experience with guitar making is necessary. French said participants will utilize the latest in advanced manufacturing equipment, such as a CNC laser cutter and CNC router, in addition to sanders and saw planers. The cost for the workshop is $1,295, which includes all materials and supplies. Purdue employees can receive a $150 discount. Attendees will receive a complete kit of materials, including a guitar body and neck made with figured and exotic woods and with most of the machining already completed. Participants will then be able to tailor the final shape of the body and neck, as well as add other custom touches, such as paint.